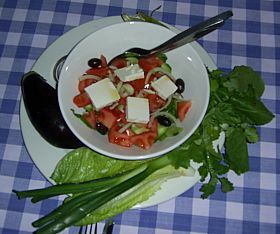 World famous Greek Salad - healthy recipes from the Mediterranean island of Cyprus. The island of Cyprus is famous for it's Mediterranean Cuisine. The Healthy Salad Recipes you'll find here, cypriots enjoy everyday. This salad can be enjoyed as a starter with local greek bread and a healthy greek salad dressing. Salads are part of the staple Mediterranean Diet and the Island of Cyprus has the best healthy diet reputation. These famous dishes of colourful vegetables are made from the abundance of locally grown, in season fruits and vegetables. Your family will love them just as we do in Cyprus... Yummy and Healthy at the same time!! I'll give you approximate measurements, add more or less of an ingredient to suit your taste. It's always best to use fresh produces. It's understandable that you may not have access to, for instance, fresh olives. If it's not possible substitute with vacuum packed, tinned or jar. A Tip about Lettuce Crisp green leaf lettuce is best. Don't use Iceberg lettuce its tasteless with zero nutritonal value. It's somewhere around 70% water. Wash and dry all the vegetables. Cut the lettuce leaves into thin slices, about 1/2 inch strips. Place the lettuce in the bottom of a large salad bowl. Chop the celery, green pepper, tomatoes, cucumber into small 1 inch chunks. Thinly slice the cabbage and the onion, add to the salad bowl. Mix the chopped vegetables with the lettuce. Now break off a handful of parsley and coriander, wash and dry. Chop and sprinkle onto the salad. Toss again to mix the parsley and coriander into the salad vegetables. Scatter the black olives over the salad. Cut the fetta into to 1 inch cubes and scatter around the top of the salad. At this point you can sprinkle a few tablespoons of olive oil and a little of the wine vinegar over the salad just before serving. But... here's a tip for you. Let each person add dressing to their own portion, that way, any left over salad can be covered and refrigerated. It will keep fresh and crispy until the next day. Tomato Salad, Beetroot Salad and more to come.